Although not a major player during the course of the First World War, Southeast Asia was in fact altered by the war in multiple and profound ways. 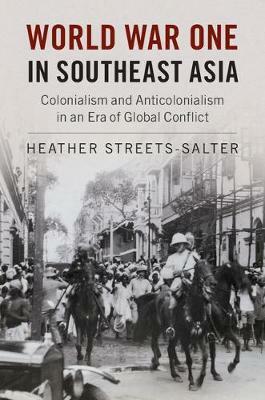 Ranging across British Malaya, the Dutch East Indies, and French Indochina, Heather Streets-Salter reveals how the war shaped the region's political, economic, and social development both during 1914-18 and in the war's aftermath. She shows how the region's strategic location between North America and India made it a convenient way-station for expatriate Indian revolutionaries who hoped to smuggle arms and people into India and thus to overthrow British rule, whilst German consuls and agents entered into partnerships with both Indian and Vietnamese revolutionaries to undermine Allied authority and coordinate anti-British and anti-French operations. World War One in Southeast Asia offers an entirely new perspective on anti-colonialism and the Great War, and radically extends our understanding of the conflict as a truly global phenomenon.